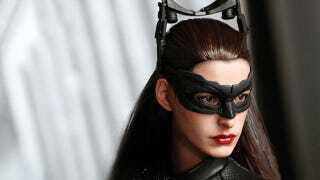 The last few months of Hot Toys' show-stopping range of Dark Knight Rises figures have seen some great pieces, but the range's reveals (presumably) come to a close today with the fourth and final primary character from the movie, Anne Hathaway's Catwoman. To be released in March 2013, she's available now for pre-order, and will cost USD$195. For that kind of cash you get an 11-inch figure with a terrifying likeness to Hathaway herself, who while short on accessories does come with a variety of interchangeable hands, a pistol, "real" hair (ie not a plastic sculpt) and a fabric outfit. You can get one at the link below.